I live in an apartment complex in which there is a problem with pests, more specifically cockroaches. I have tried many things to get rid of the problem, but to no avail. The management at the apartment complex has there own pest control company to come in and spray all the units, but it does no good. I actually notice an increase in roaches shortly after the pest control company treats my unit. It appears that the pesticide that this so-called pest control company uses is nourishment for roaches! My housekeeping is fairly good, as I have always washed dirty dishes immediately, swept, mopped, and vacuumed my floors. I make it a point to take out the garbage at least twice a day. So, in other words, I don’t leave any food out for the roaches. A staff member at the apartment complex revealed to me the main reason for the roach problem. She told me that a couple of my neighbors had very dirty living conditions (for privacy reasons, she didn’t identify the dirty neighbors). I tried traditional roach sprays, which work fairly well. In the middle of the night, I used to wake up just to go on a killing spree and spray every roach in sight. Like I mentioned, this works good. However, one problem that I have with traditional roach sprays is the bad odor that is left behind after spraying. The smell is sometimes so strong, that it is carried into my bedroom through the A/C vents. Another problem that I have noted with traditional roach sprays is that they only kill roaches on contact. I am more interested in products that kill on contact as well as repel roaches and prevent future generations. Products, such as Riddex are very appealing to me, but every time I go online to order, it is out of stock. The roach infestation was so out of control, that whenever I cooked or sat down to eat, the roaches would come out a lot more often. They would come out, fearlessly, like someone had invited them all to dinner. And don’t get me started with the roach droppings and stench they leave. The last straw came after I was attacked by a large, flying cockroach in the wee hours of the morning. I was awoken by the feeling of the roach crawling on me and I jumped out of bed screaming in horror. I woke my family up with all the screaming and they all wanted to know what the hell was wrong with me. I have seen burly men reduced to screaming, little bihotches by flying roaches. Well anyways, I think that I have found what I am looking for in Raid Max Bug Barrier with Auto Trigger and Hot Shot MaxAttrax Roach Killing Powder with Boric Acid. Hot Shot MaxAttrax Roach Killing Powder with Boric Acid comes in a white powder form and it is manufactured by Spectrum Group, Division of United Industries Corporation. I got a 16 oz. bottle of it at the Home Depot for about $4.50. The product contains 99% orthoboric acid, which is the active ingredient. It is so simple to use and it‘s not messy. I like to thoroughly clean my apartment from top to bottom and then sprinkle Hot Shot Roach Killing Powder into mainly the cracks, crevices and other places that roaches tend to hide. I sprinkle it especially in cupboards and cabinets. Some people mix it with sugar, but I don’t bother doing that. I am careful not to put it near food and utensils, though. By the way, I hear that it is effective for killing ants as well. I used Hot Shot MaxAttrax Roach Killing Powder for the first time last year. After using this product I saw a large reduction in the amount of roaches running around the apartment. You notice a big difference after only a few days. It is actually amusing to watch the surviving (but dying) roaches walking around, trembling like they are high on drugs. Whereas before, I would get up in the middle of the night and see about 30 or so roaches walking around on the kitchen counter. After using Hot Shot MaxAttrax Roach Killing Powder, I saw maybe a few roaches coming out sometimes. There are no noxious fumes or bad odors with using this product. I was reasonably satisfied with the product, but still felt that there was something better available. I wanted to up the ante on my war against roaches. Well, I recently came across a $3.00 coupon in the Smartsource for Raid Max Bug Barrier. I decided that if I could get it at a decent price that it would be worth a try. I purchased a 64 fl oz. bottle at Walmart for $11 (minus the $3.00 coupon) and began to use it that very evening. The thing that I love about Raid Max Bug Barrier is that not only is it effective, there is no horrible smell. It’s manufactured by S.C. Johnson and Son, Inc. which claims that the product is also effective at killing ants, fleas, flies, gnats, ticks, spiders and a host of other pests. The bottle comes with a battery operated, automatic trigger that makes a funny sound. I spray it around every corner of my home, mainly at the baseboards. I sprayed it underneath the kitchen sink where I keep non food items, behind the refrigerator, and behind the stove. 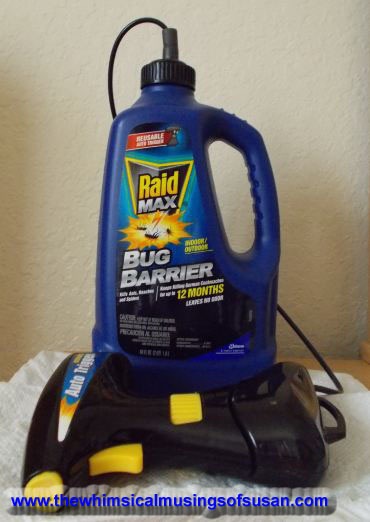 The manufacturer states that Raid Max Bug Barrier keeps killing German cockroaches for up to 12 months. The active ingredient in it is 0.03% deltamethrin. I have to add that I am now using Raid Max Bug Barrier in conjunction with Hot Shot MaxAttrax Roach Killing Powder. I have been using them both for about three weeks, and the results are astounding to say the least. The roaches aren’t completely eliminated, but at least the infestation is no where near what it used to be. Flying roaches don’t attack me and the roaches don’t come out like they used to. I see one or two roaches every few days. I even get up in the middle of the night just to check, and still no roaches. Thank you Raid Max and Hot Shot! The only down fall that I can see with using these products is that every week I have to clean roach corpses from the cupboards and behind the fridge and stove. That’s a small price to pay for getting rid of those little bastards. Of course, you should carefully follow the manufacturers’ instructions for using these products. Both products are potentially harmful and must be kept out of the reach of children and pets. Now I stated that I use the two products in conjunction, but I don’t commingle or mix them. I never use one product on top of the other. The two products are used in separate areas of my apartment. Taking this a step further, I do not even suggest that you use these products together. For more information about Hot Shot MaxAttrax Roach Killing Powder with boric acid visit www.hotshot.com or call 1-800-917-5431.